This Taonga is named Kōmārohi. This means Strong and Powerful. In general, the whale tail represents strength, power, and speed. Such symbolism is obvious to those who have directly encountered these masters of the sea. There are also elements of sensitivity and hidden knowledge held within this symbol. This relates to the great empathy and intelligence that these great mammals possess. There are historical and recorded instances where help to humans has been given by the mighty whale. A symbol of strength, power, speed, sensitivity and hidden knowledge. The design on the front of the carving has several layers of meaning. The pattern flowing up the neck of the carving represents the currents of the ocean. This is symbolic of the currents of our spiritual life arising to the surface and guiding us to gain the attainments of inner peace and liberation. 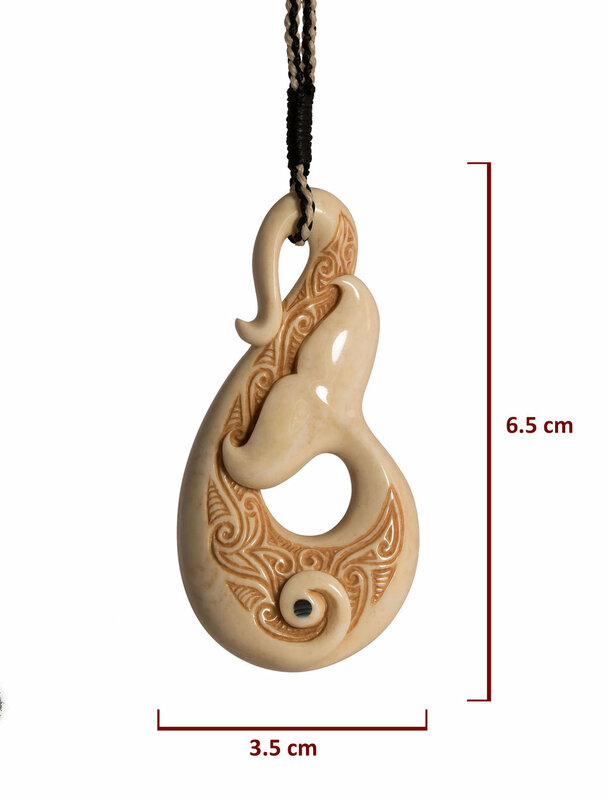 In the centre of the carving is a koru with an inlay of Pāua. The koru symbol is common in New Zealand and is inspired by the unfurling of the new fern fronds. Meanings associated with this are new growth, new beginnings and awakening. The Pāua inlay represents the pure nature of mind. In the innermost sanctum of our being resides this pure nature. Hence, it is located in the ‘heart’ of the carving. 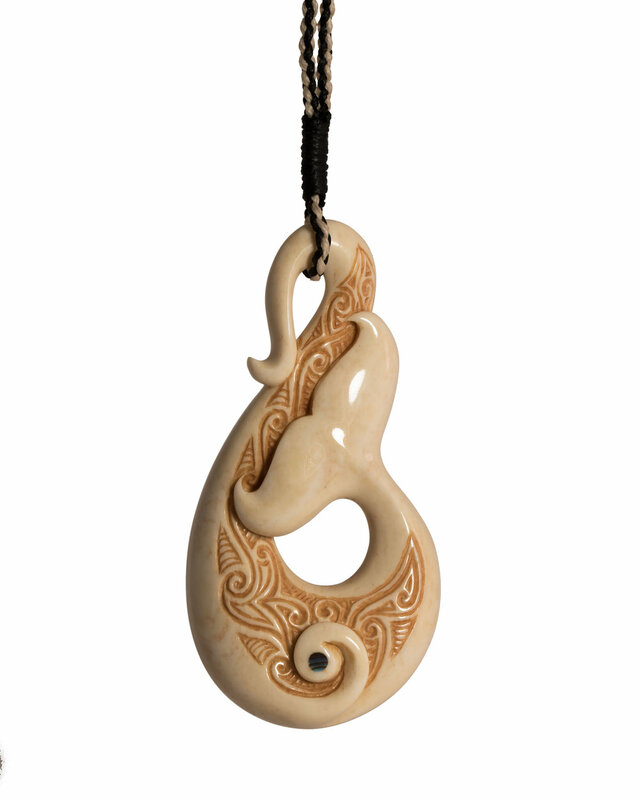 Emerging from this Koru with the Pāua inlay is a design that connects to the main pattern which flows up the neck of the carving and represents the ripening of our potential. The design on the back of the tail is symbolic of the sacred principle “as above, so below”. Another way of understanding this is that a pure mind gives rise to a pure world. All things are a reflection of our mind. Our attitudes and views towards certain situations are what is most important. It’s not the situation itself, but how we relate to it that is most important. For example, we could be on waiting for a plane trip and be happy, excited, or peaceful about the waiting, or we could be waiting for the same plane trip and be impatient. The nature of the activity is the same (i.e. waiting) the relationship our mind has to this experience is different depending on our positive or negative attitude. The design on the back of the tail is symbolic of the sacred principle “as above, so below”. Another way of understanding this is that a pure mind gives rise to a pure world. All things are a reflection of our mind. Our attitudes and views towards certain situations are what is most important. It’s not the situation itself, but how we relate to it that is most important. For example, we could be on waiting for a plane trip and be happy, excited, or peaceful about the waiting, or we could be waiting for the same plane trip and be impatient. The nature of the activity is the same (i.e. waiting) the relationship our mind has to this experience is different depending on our positive or negative attitude. I sincerely hope you enjoy the carving and over time come to fully understand all the various layers of meaning imbued in this creation and I wish you and your family the deepest peace and happiness.